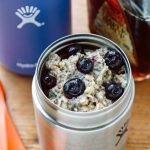 A quick and easy oatmeal recipe with a coconut and chia seed twist, this is a perfect grab and go breakfast. Oatmeal fatigue. We’ve all been there. Most of us just need some time off before we can eat a bowl of oats again. But some of us never fully recover, habitually keeping our distance from the Quakerman for the rest of our lives. That’s how Megan was feeling before we added this recipe to our breakfast rotation. In her words, she was “pretty much done with oatmeal.” But a flavor switch-up helped bring her back. When cooked in water and served on its own, oatmeal is painfully bland. (That’s the point of all the fun toppings!) But toppings don’t change the flavor of the oats themselves, they just give you pockets of eventful excitement. If you want to change the flavor of the oats, you’ve got to do something different in the cooking process. 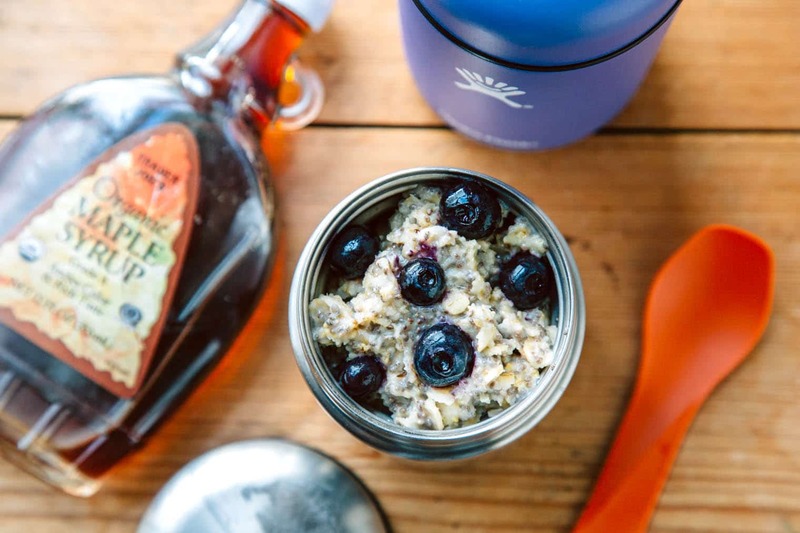 So we decided that instead of water, we would cook the oatmeal in a can of coconut milk – thereby infusing the oatmeals with creamy, coconutty goodness. The chia seeds added some protein to the mix, while a drizzle of maple syrup gave it the appropriate alpine flavored sweetness. But the real beauty of this recipe is that you don’t have to wait around the kitchen for it to cook. Just put the uncooked rolled oats and chia seeds into the insulated food jar. Then simmer the coconut milk and maple syrup in a saucepan. When nearly boiling, pour the coconut milk into the insulated food jar, seal, and off you go. The trapped heat inside the insulated container cook the oats in about 30 minutes (about the time we needed to get from the lodge to the chairlift). So if you’re looking for a quick and easy meal to make right before you head out the door, pick up an insulated food jar for yourself and give this recipe a try. ‣ It’s fast because you don’t waste any idle time waiting around for the oats to cook. They cook inside the insulated jar while you get on with your day. ‣ It’s easy because the only “exotic” ingredient is coconut milk, which is shelf stable and can be found at nearly every major grocery store. ‣ It’s delicious because the oats are infused with the coconut milk, so each bit is loaded with flavor. ‣ If you want to keep your oatmeal hotter for longer, preheat your food jar by filling it with boiling water for about 15 minutes. Dump the water right before you add the oats, chia seeds, syrup, and simmering coconut milk. 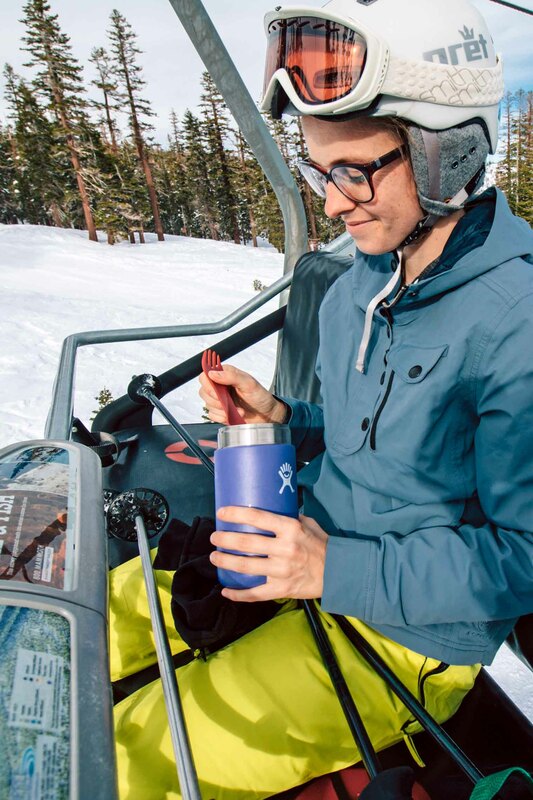 ‣ While we used HydroFlask Food Flasks, there are many great insulated food flasks on the market. So long as it is vacuum sealed, this recipe should work just fine in any insulated food jar you pick up. Mix ins: berries, sliced bananas, nuts, coconut flakes, etc. Heat the coconut milk and maple syrup in a saucepan until simmering. 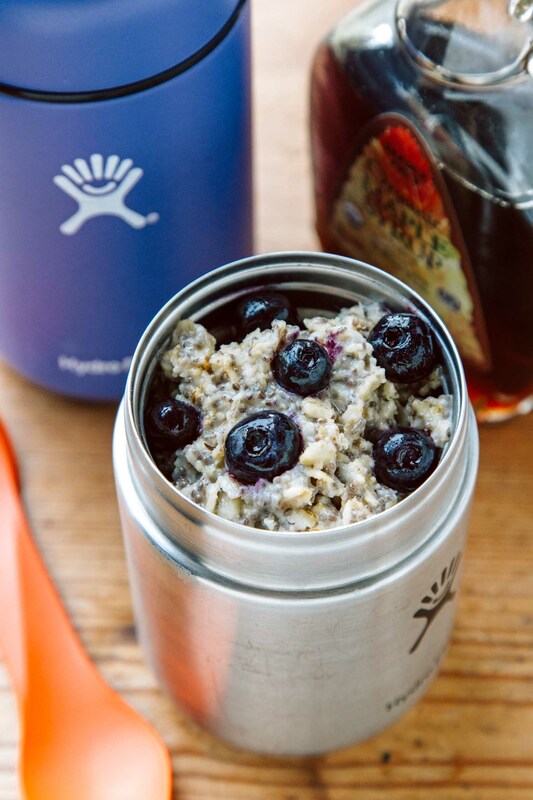 Pour into a preheated insulated food container with the oats, seeds, salt and any other mix-ins. Seal and let cook in the container for about 30 minutes. If you want to cook this on a stovetop instead of inside a thermos, simply add the oats to the simmering coconut milk and cook until the oats are tender, about 10 minutes. Definitely a vote for oatmeal with coconut milk. Living in Thailand I cook with a lot of coconut milk as it’s so cheap, and it adds such a nice rich flavor to so many meals. Haven’t put hot oatmeal in a food jar though to eat on the go. Good idea!